London Marathon competitor Liam Jolliff proposes to his girlfriend Sarah Binns after he completed the race. Running a 26 mile marathon is no easy feat, but Liam Joliff managed to reserve some energy, and keep his nerves steady, to propose to his girlfriend on the finish line. 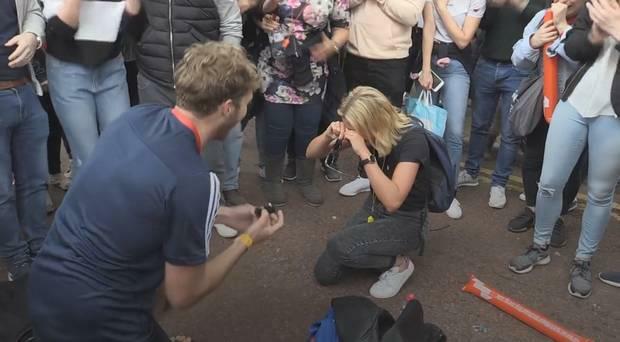 The London Marathon competitor got down on one knee and whipped out a ring for stunned girlfriend Sarah Binns after he finished the gruelling race on Sunday. Sarah was at the finish line to greet him and when she sees him with the ring she removes her sunglasses and asks, "What are you doing?" before breaking down in tears. Thankfully they're tears of happiness as she nods "yes" while he places the ring on her finger and the assembled crowd cheers. She asks him if he's serious and when he says he is they celebrate with hugs and kisses from thrilled friends and family. Liam's adrenaline levels must have been through the roof!